Allright, finally back in the Sierra Nevada. The second day of my two day outing. Rich and I got up at 4:20 and left the hotel room shortly thereafter. It was only a 25 mile drive to the trailhead: 15 miles south on 395 and then 10 miles west to get to Glacier Lodge. When we arrived, it was still dark and we used our headlamps while getting ready for the hike. After putting our bags containing edible stuff into the bear lockers, we set out following a paved road along the South Fork Big Pine Creek. A quarter mile into the hike, Rich confessed to not having closed the bear locker, which he had used last. Great, I thought, while running back and closing the darn thing. I caught up with Rich, who was waiting for me at the end of the paved road. We followed the trail passed the North Fork turnoff and followed a fairly flat meadow into the John Muir wilderness. Two guys that we had met in the parking lot were headed up Agassiz today via the North Fork and Rich and I discussed the merits of starting the hike at 7500 feet even though there was a shorter and more convenient (~10,000 feet) trailhead at South Lake. 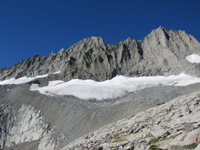 We concluded it must because of an interesting climb up Agassiz's south face. I made a mental not to check that out once I got home. We were now marching in daylight and the first rays of the sun illuminated our destination, Middle Palisade and neighboring Norman Clyde Peak about 6000 feet above us. At the end of the meadows after about 1 mile, the switchbacks up the headwall began and now we began to sweat. When we reached Willow Lake we were ready for our first break. Luckily, we were still walking in the shadows and we therefore did not break for too long, but agreed on taking an extended break at Finger Lake. After Willow Lake the trail continues up to Brainerd Lake and petered out shortly after that lake. We climbed up large granite slabs in the general direction of Finger Lake and arrived there shortly after. The lake was quite beautiful. Burd describes it as one of the most beautiful ones in the Sierra and I had to agree. However, I am still a loyal fan of the Little Lakes Valley and not too many other lakes come close to the lakes in that valley. We filtered water and set off soon after, now already baking in the sun. Another 1000 feet of "granite slabbling" and boulder hopping brought us up to the beginning of the moraine. We could already clearly make out the glacier and the rib that was dividing it and which we would eventually have to mount. It still looked far away. We stayed high on the moraine and were able to avoid the sandy talus but faced continuing and relentless boulder hopping instead. Middle Palisade's east face looked pretty intimidating the closer we got, and we were not yet able to make out the route leading up it. We knew that other parties had a bit of routefinding problems and that Class 3 scrambling would be the easiest route up the mountain. Since we did not want to mess with too much class 4 climbing, finding the easiest way up was essential. When we reached the end of the moraine (or the highest point), I conculted the picture I took in the "Climbing California 14ers" book the night beforel. Drawn into the picture was a route that went up the left glaciar for about 80 feet before turning right up an obvious class 2-3 route up the mountain. Traces in the snow showed us that we were not the only ones to have chosen that approach and we had not problem finding the beginning of the rocky climb up the east face. However, after 10 minutes of following the Class 2-3 section we ended up in a wide open chute. Looking up we saw a number of other chutes leading up the mountain. All of these chutes led up the mountain, however with varying degree of difficulty. I was a few yards before Rich and thus I chose an obvious route that I thought could get us close to the summit ride. However, after following that chute for about 40 minutes, the easy class 2 turned into class 3 and then into class 4, and I decided to look for a better way up. A few minutes earlier, Rich had heard voices coming from a chute further north, and I climbed up to the rib dividing the two chutes and found a much more pleasant and wider chute, that I instantly recognized as the one that was described by Burd and the guide books. Furthermore, about 50 yards below us, we saw 2 decending climbers (women as we found out when reading the summit register later). I waved, but did not receive any response from them, even though they were looking up. They had probably forgotten their contacts. From that point on the the climbing became much easier and another half an hour later I topped out on the ridge. I could make out two highpoints, that were maybe 20 yards apart. I wen to the lower one first, thereby leaving the summit of Middle Palisade to Rich. While sitting on the lower summit, I managed to get a couple of nice shots of Rich working his way up to the real summit. He took pictures of me from where he was. I then traversed the 20 yards and reached the summit about 7 hours after we had set out that morning. The views were again spectacular. We could see Williamson and Tyndail clearly to the south, and also make out mountains such as Goddard, Brewer, Darwin and Clarence King in the distance. Closer mountains were Sill, North Palisade, and Splitt as well as Birch Mountain and Kid Mountain. I was curious about the traverse to Dissapointment and Balcony Peaks and followed the ridge a bit in that direction. The traverse was not too difficult, if one stays on the high point of the ridge, but at then about half way into the traverse a deep cut in the ridge told me why Dissapointment Peak is actually its own summit and not just a subsidiary of Middle Palisade. At this point I decided to turn around, also because Rich was waiting, but I also promised myself that I would be back to approach the mountain from that side via the traverse. Back on the summit, I admired the selection of canned goods that someone had left on the summit, signed the register and took about a million pictures before heading down. The climb down the class 3 sections turned out to be less proablematic than anticipated. However, it tooks us about 7 hours to get down, so about exactly the same time that it had taken us to get to the top. the boulderhopping was getting very tiring, but once we had arrived at Finger Lake, the trail began only a few hundred feet below and we descended to reach the car with penty of daylight to spare. Mc Donalds in Bishop and pently of mountain dew and other sodas will driving back to Davis, enabled me to drive all the way back to Davis, where we arrived at about 1:30 in the morning. On the way back we listened to some fun sateliite radio and spent the evening guessing the songs and artists. all in all another perfect day in the Sierra.